Camp Nou (Catalan pronunciation: [kamˈnɔw], New Field, aften referred tae in Inglis as The Nou Camp) is a fitbaw stadium in Barcelona, Catalonie, Spain, that haes been the hame o Futbol Club Barcelona syne 1957. 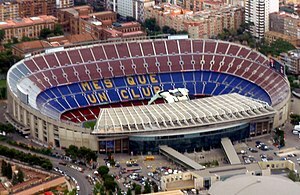 The Camp Nou seats 99,786, reduced tae 96,336 in matches organized bi UEFA, makin it the lairgest stadium in Europe an the 11t lairgest in the warld in terms o capacity. It haes hostit numerous internaitional matches at a senior level, includin twa UEFA Champions League finals an the fitbaw competition at the 1992 Simmer Olympics. ↑ 1.0 1.1 "Information". FC Barcelona. Retrieved 16 August 2010. This page wis last eeditit on 21 Mairch 2018, at 21:51.